Years ago I used to backup my data to DVDR’s that hold 4.7GB each. I would buy giant spindles of 100 discs for $22, which comes out to about $45/TB. As hard drives got bigger and prices for multi-terabyte drives became more affordable, it started to make more sense to store my data to hard disks instead. In addition to being cheaper, with hard disks I am able to modify the data afterwards and they take up less space on my shelves. For my file server, even with the more expensive Western Digital 6TB Red drives that were designed for 24/7 usage with a 3 year warranty, I was paying about $36/TB. What if we were looking for drives for the lowest cost available for file storage as a datahoarder? Here are some solutions I’ve considered. An internal Western Digital Red 8TB NAS drive currently retails for $279.99 on Amazon.com or $35/TB and a 6TB Western Digital Blue desktop drive is $196.99 or $33/TB. Due to the popularity of laptops, consumer demand for internal 3.5″ drives are down. Most the internal drives these days are purchased by computer manufacturers like Dell, HP, and Lenovo; large businesses such as Google, Facebook, and Amazon for use in their datacenters; and PC enthusiasts who are building or upgrading their own PC’s. Instead of purchasing internal drives, consumers have mostly moved to buying external hard drives that can be connected to their laptops by USB and Thunderbolt. This is reflected by lower prices for external drives even with the additional enclosure. Clever shoppers have discovered that for getting the best price on internal hard drives, they can disassemble the external hard drive enclosure and pull out the drive inside for use in their computers and servers in a process called “shucking”. One computer backup company, Backblaze, actually paid users to go out to their local stores to buy external drives during the hard drive shortage from the 2011 Thailand floods that affected factories in the country and led to higher prices for a period of time. Recently in July 2017 Best Buy had external Western Digital Easystore 8TB drives on sale for $159.99 from their regular price of $199.99. People who dissected the Easystore found that these contained Western Digital Red drives, the same drives that are selling for $279.99 on Amazon. That is a savings of $80 and up to $120 when on sale. That comes out to a cost of $25/TB and $20/TB on sale. However, a major drawback to consider before removing a drive from of an external enclosure is that there is a chance the hard drive manufacturer may void the warranty if the temper seals or plastic clips on the enclosure are broken. One way we can deal with this is by self-warrantying the drives ourselves if we are purchasing a number of drives. 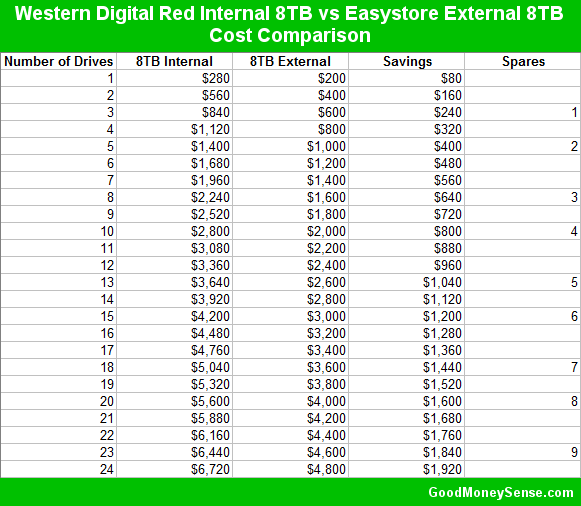 As we can see from the below table comparing the internal WD Red 8TB to the WD Easystore 8TB at their regular retail price, at three drives we start saving enough money to afford an extra drive as a spare in case of a failure if we self-warranty. If we were buying 24 drives today for our file server, we can save $1,920 or almost 30% (or $2,880 and 43% if on sale) by going with external drives compared to internal drives. This savings can afford us nine spare drives for future drive failures. Not only that, instead of shipping a defective drive to the manufacturer and waiting a week to receive a refurbished drive in return, we can we simply go into a local store to pick up a new drive that same day. In our situation where we want to backup our 144TB file server, using external drives in their enclosures are the perfect choice since we only need the data during a catastrophic failure such as losing the entire RAID6 array or having three simultaneous drive failures. We can purchase the drives individually as we need them to lower our upfront costs and store the full drives off-site and powered off for less wear and tear on the drive motors. If you are considering shucking external drives, I would recommend running drive burn-in and health check tools such as badblocks and a long S.M.A.R.T test on the drives while they are still in their enclosures to weed out any DOA or early drive problems. Generally drive failures follows a bathtub curve where the most failures happen in the beginning and end of their lives. 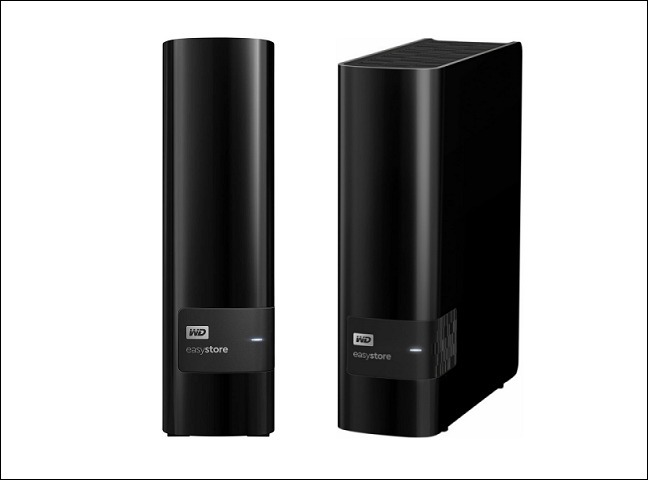 If we needed NAS drives with a warranty, one thing I’ve consider is the Western Digital My Book Duo 16TB for $499.99. The My Book Duo has two 8TB Red drives inside, a two year warranty, and the enclosure is user-serviceable, allowing us to remove the drives to use in a computer or server without voiding the warranty. This comes out to $249.99 for each 8TB drive, making them $30 a drive less than buying an internal 8TB Red at the cost of a year of warranty, and we can also sell the enclosure on eBay if it is no longer needed. For even more savings and if you are a student, teacher, or administrator and staff at a college or public school, Western Digital offers a discount of 20% off of products purchased from their online store just by creating an account using your school’s email address. This discount allows you to purchase five of the same item every other month with free standard shipping. You will most likely still need to pay sales tax. 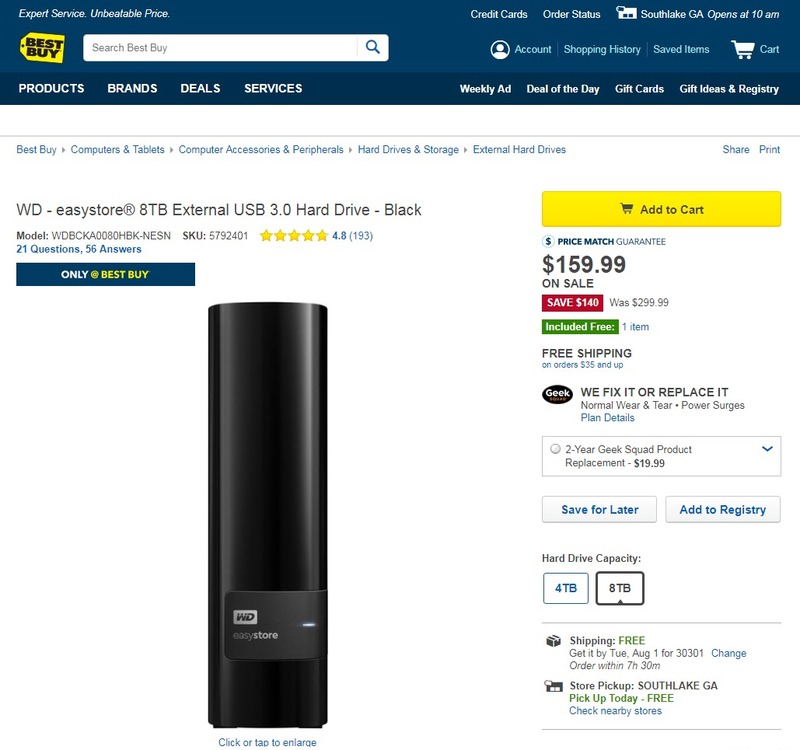 That Western Digital My Book Duo 16TB now costs $399.99, or $200 a drive with the discount, which is the same price as the Easystore when not on sale.